An INSANE Dessert Zone With Churros, Black Ice Cream & More @ Pepsi Presents Horn OK Please Fest! 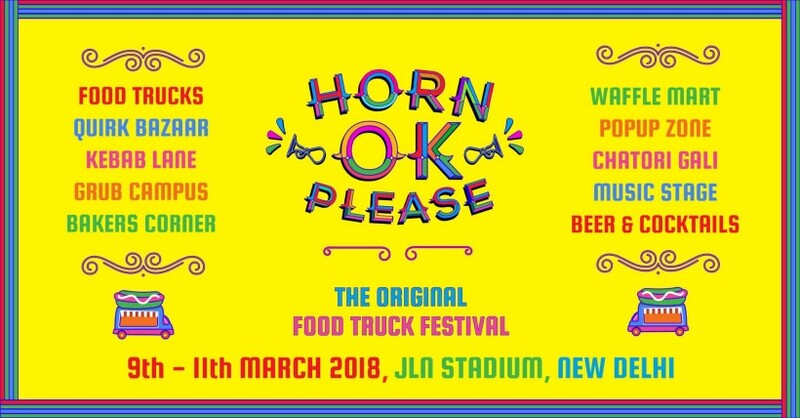 The original food truck festival of Delhi, Horn OK Please is BACK with a bang for version 3.0 and this time it brings, apart from the whopping 50+ food trucks, a bunch of other super cool and exciting things! When you’re done gorging at all the savoury food from the 100+ stalls, you can then move on to the prized gem - the ‘Dessert Zone’, an area that’s all things sweet and sugar coated! YAS! Churros, Black Ice Cream & Macarons *WOAH* | This one’s an area dedicated to all things sweet going from red velvet churros to macarons, cupcakes, cakes, cake jars and so much more! Not only this, they’ve also got a bunch of super cool ice cream brands on board scooping up the all new massively popular activated charcoal ice cream i.e. black ice cream! Plus, there’s also going to be a live cold stone ice cream centre churning out fresh ice cream rolls! YUM! Some of the vendors that we’re super excited to go check out are Baker Confidential, Sugarama, Oh So Stoned, Creme Borne and Eyes On ICE, among tons more! All this and lots more awaits you at Horn OK Please’s 3rd edition! There’s going to be LOADS of food trucks, a crazy awesome Waffle Mart, a Quirk Bazaar, a Pop Up District, beer vends, a cocktail bar and some great live music! Can’t wait for Horn OK Please to start already!